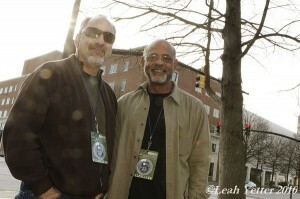 2010 was my first experience with the Macon Film Festival after years of hearing about how wonderful a time it was. I have to say, MaGa surpassed any and all expectations I could have possibly dreamed up from the tales I had been told from years past. 2010 was especially momentous because it was the fifth anniversary of the festival, and the organizers did NOT hold back in celebrating this milestone! Some of the highlights that were special to Concert Sutra I will share with you here. After reading, you will understand why it is that I am hooked will be forever ready for a good Q&A! Concert Sutra’s Photographer, Leah Yetter has been attending the Festival for as long as it has been an event, and told me year after year how she knew, based on my love of the arts and film, how much I would enjoy MaGa. She has only been more right only a few times in our longtime friendship!! As you can see, we had a blast at the 2010 MaGa Festival! For more information and to see past coverage of the Macon Film Festival, visit their website at http://www.maconfilmfestival.com/. The Macon Film Festival is generally a Thursday through Sunday event, and every minute of it is worth catching. The schedule seems to allow for all of the films that one would want to catch, sometimes showing them multiple times at different venues. The main venues for the films and workshops include The Cox Capitol Theatre, The Douglass Theatre, the Macon Marriott City Center, and Mercer University. The films cover a wide range of emotions, and the workshops are informative and inspiring enough to make me want to transfer my theatrical talents to those of screenwriting and filmmaking. I first showed up on Thursday evening, even though there were festivities going on most of the day. 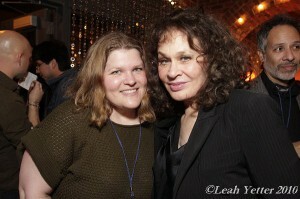 My first time with MaGa was meeting Karen Black and watching Illeana Douglas’ web-based series Easy To Assemble. Illeana Douglas participated earlier in the day in the dedication of the “Best In Show Award” renaming it after her grandfather, Macon native, Melvyn Douglas. She also participated in a Q&A with her Producer, Dominik Rausch, along with her super cute pup Godfrey who follows her everywhere. Easy to Assemble takes place in a world where Illeana Douglas as herself works as an associate at IKEA. Her “best” friend Justine Bateman also decided to work (or pretend to work) for IKEA. Much of what we were viewing surrounded the friendly competition between Illeana and Justine. During the Q&A, Illeana indicated that there would soon be a Season 3, so to check it out and see what the series is all about, visit the website, http://www.easytoassemble.tv/episodes.php. 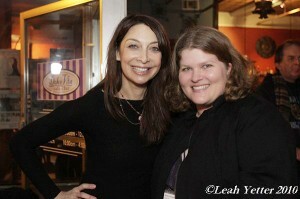 Maybe the most exciting part of the evening was the Festival After Party at Dolce Vita Café and Bar where I was able to chat with Illeana Douglas! I brought my ticket from 1996 when I saw her on the David Letterman Show in New York City, and asked her to autograph it. She laughed and told me that that was actually her first appearance on a talk show! First on the Agenda for Friday, was a very tough to watch for me (who is a bleeding heart for the animals), but important piece of work, Tom McPhee’s An American Opera. So many people were aware and concerned about the animals left behind during the tragedy of Hurricane Katrina, but Tom went and did something and incited others to do the same. I applaud Tom McPhee for all of the heart wrenching work he does. It takes a very strong artist to witness the types of disasters he documents and not walk around with tears streaming and a box of tissue! I did not make it past the first scene in the movie before I was crying uncontrollably. His work is necessary and extremely special. When asked during the Q&A how he is able to keep it together while working with such difficult subject matter, he explained how he uses the camera as a filter to hold it together and get the job done. However, once he is done, and the final project is complete, he allows himself to grieve and be overwhelmed with the emotions he feels. I can only say WOW! Tom is working from a mentality that having cameras in a disaster situation keeps folks on their toes. 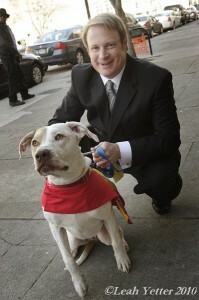 The most penetrating quote that I took away from An American Opera is, “our treatment of animals is a reflection of our society.” I am not the only one in awe of the work of director Tom McPhee, local Macon celeb AC Pup, the mascot of the Macon Animal Control Shelter, came down to the screening to collect donations and give love to those in attendance. Next on our Friday Agenda was a highly unexpected treat called Automorphosis, which showcased the outstanding work of many car artists worldwide. These cars were so amazing that one might not actually believe that they were cars! Some of the themes that stood out to me the most included the following: out house coffin car; spoon car; yarn car; brass van; hamburger motorcycle; liter bug VW Bug; horn car (from Smyrna, Ga); penny van; land yacht, which looks like a boat, but has a bed and couch inside; stain glass mosaic car; van covered with cameras that looks like a camera and can actually take photos; body part car; and a car cathedral made of a hearse and a partial VW Bug on top! I am forever bewildered by the heights that some artists are able to achieve when they are moved to do so. Later on Friday night, we found ourselves catching a series of short films. The Dinner Party featured a very strange couple who lived in a neighborhood where the folks who live there actually have a manual on wrongdoings and missteps regarding neighborhood covenants. The dinner party at question was an intervention of sorts that goes gravely wrong without the need for the cyanide casserole! Misfortune Smiles was an interesting short involving a fortune teller, crystal ball, and some deadly predictions. To top the night off, we got a special screening of director Steve Balderson’s newest project Stuck, as well as a fabulous Festival After Party at the Sochi Gallery. The house was packed at both events, partially due to the largely local cast used in the movie Stuck. All those involved were out and ready to view and party! The story of this homage to 50’s female prison black and white movie revolved around a suicide that was mistaken for a murder. Most of the staging occurred in the jailhouse where the main character Daisy, played by Starina Johnson, ended up after being falsely convicted of murdering her mother, played by local September Carter. Karen Black (who has quite a long career, but my favorite is seeing her work with Rob Zombie in House of 1000 Corpses) plays a neighbor witness who struggles with what she has witnessed throughout the film. Jane Wiedlin formerly of the Go-Go’s even plays one of the lady prisoners. She doesn’t say much, but is quite a character. If you know the local Macon Theatre community, you will see Theatre Macon Director Jim Crisp as a lawyer in the movie, and Theatre Macon regular Tom Morris as a doctor! Pleasant Gehman who plays Dutch really looked the part, and did a fabulous job leading Daisy through prison life. Dutch and Daisy ultimately fall in love and have a gratuitous mutual masturbation scene before Daisy’s demise. Stealing the show in my opinion was the Guard played by Stacy Cunningham. This character was mean, nasty, and hilarious! Cunningham played her flawlessly. Saturday was full of fun and high learning for yours truly! Days like Saturday at the 2010 Macon Film Festival make me understand why the organizers of this festival put so much of their time and energy into putting this thing together. The Filmmaking 101 workshop with writers and filmmakers Michael Buchanan and Jason Winn and the Acting for Stage and Screen workshop with actress Illeana Douglas was my best spent time of the entire festival. I learned so much about the processes of filmmaking and screen vs. stage acting that I was moved to give filmmaking a try! I have always loved film and have had an over the top obsession with movies, but never thought to give it a go. Since these workshops, I have been working on a screenplay of my own that one day I hope to submit to the Macon Film Festival!! Who knows, right? The Filmmaking 101 workshop offered a step by step guide to getting a film made, from the process of screenwriting to the hardest part of finding the funds to actually shoot your work. Every bit of information from Michael Buchanan and Jason Winn has helped me s far in my journey to get a screenplay written, and networked to the right folks. 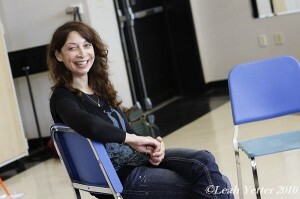 One of the highlights of the Acting for Stage and Screen workshop with Illeana Douglas was the demonstration of the different methods of acting used by Douglas in her work. Being such a successful actor, Douglas was able to give examples that all attendees would recognize. She also made it fun and interesting by using members of the audience to establish the nuances of each method. One “Ah Hah” moment I had during Illeana’s workshop was when she explained why she preferred screen work to stage work. With stage work, all of this time and energy is put into the project only to show for the run of the play, and with screen work, all of your time and energy, once it is complete will live on forever in the form of a film. This seems pretty obvious, but I just never thought of it this way. Getting geared up for the grand finale on Saturday, Forgetting Sarah Marshall, we were able to view quite a few features and shorts. One really special Narrative Feature, Blue Bus, starring Ron Recasner as August Dupree and director Phil Scarpaci as Joseph Mafe, followed two friends on a trip with a purpose that ended in a New Orleans cemetery. In the final scene, all of the music and soul culminates into a very touching a cappella song in memory of loved ones passed. On the last day of the festival, there were some technical difficulties on the final viewing of Blue Bus, and the actors who were in attendance of the festival gave an extremely special live version of the end of the film, song included. Goosebumps for all. Letters From Home was a touching short about the soldiers in Afghanistan and their different experiences surrounding the mail call. Puppets of War on the other hand was a graphic short made with puppets, carnage, death, and buckets of blood. And then there was Alley Pat: The Music is Recorded…this Documentary Feature was my absolute favorite of all of what I saw! Alley Pat was a disc jockey in Atlanta in the 50’s who did a lot of improvising, especially on the sponsor’s commercials. The advertisers loved his style just as much as the listeners, because they paid him directly instead of the station. He told it like it was for sure. His humor crossed the color lines, even way back then! He was so loved by the artists he played that he had the Drifters, Temptations, Sam Cooke, Lil’ Richard, Ray Charles, Aretha Franklin, and more coming to the studio to promote shows they had coming up. Alley Pat even went on tour with Ike and Tina Turner. In the 60’s, he worked as a bail bondsman, and with the civil rights movement helping get folks out of jail. His tag line “the music is recorded” came from the 30’s when there was a requirement to state when non-live music was being played. His personality, even now when he is into his nineties comes through loud and strong. The personal recordings that were saved throughout the years by the director of this documentary, out of love for his show, would be extremely valuable in a personal collection in my opinion! I would love to listen to them all day long. The more recent interviews that also made up much of Alley Pat: The Music is Recorded are also classic and priceless! Read the blog and hear some clips from Alley Pat here: http://alleypattapes.blogspot.com/ and subscribe to the Alley Pat You Tube channel at: http://www.youtube.com/user/AlleyPatMovie. This documentary should be distributed worldwide, but I am just glad that I was in the audience at the 2010 Macon Film Festival to learn about this genius piece of work on what I believe was the first time it was shown! Another highlight of Saturday was the Student film Unearthed that was written, directed, produced, and edited by Alexander Atkins. This film is very true to its name, and has a lot of Earthy imagery. A man moves to the country to write, and becomes temporarily obsessed with his distractions. A tree that the main character struggles with to decide whether to leave it inside or plant it outside plays a great role in this short film. After deciding to plant the tree outside, while digging, he hits something under the Earth. The tree ends up back in the house while the unknown object under the ground became the main focus. It turns out that it is a car under the ground, which housed personal items, including a lamp, a box of random stuff, and an old school typewriter. In the end, the character, after getting through nightmares of being buried in the car, ends up comfortable using the typewriter to write freely with the tree buried in the yard. This film has a fantastic soundtrack, and awesomely dreamlike cinematography. For more projects from this director, and to see more on Unearthed, visit http://www.drawingboardfilms.com/. This Side Up was one of the most fun and entertaining Narrative Shorts on Saturday. A guy gets in a cargo crate to ship himself to a girl. He has beer and Cheetos in the crate with him. Eventually, the guy gets out of the crate in the back of the delivery truck, and discovers a Mexican guy in another crate. They end up smoking a joint together and getting really blitzed and playing cards to pass the time. Once they are close to delivery, they get back into the crates. The problem is that the crates are mixed up. The main character ends up in Mexico, and the Mexican guy ends up with his girl. For sure a comedy of errors! 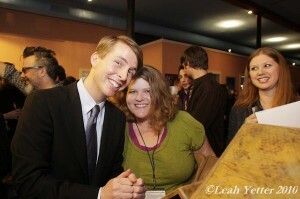 The grand finale of Saturday was watching on my favorite films, Forgetting Sarah Marshall, Q&A with actor originally from Macon Jack McBrayer, and the Festival After Party at Bright Blue Sky Productions. Jack spoke with the audience, and answered many questions. He also got a key to the city from the Mayor and a special MaGa Award. He explained how he met Tina Fey at Second City in Chicago, and got started doing a lot of improvisation. Then, Tina Fey wrote the character, Kenneth, from 30 Rock with him in mind, which is a dream come true! Of course, he loves working in films with Judd Apatow…who wouldn’t!! When asked if he would consider doing serious roles, he said he would, but he bet you’d laugh! Sunday, the last day of the Festival was another full day/night of workshops and films. I first made it to the Renegade Filmmaking (Small Budget, Big Film), where Stuck Director Steve Balderson gave many great tips on budgeting and ways to cut corners without compromising the quality of the product. He talked quite a bit about selling yourself and your work. Balderson even suggested a great payment schedule for folks who have to pay upon selling, which would have to be most all of those starting out in the craft. He also went over many important steps in the process, from writing to casting to storyboarding to shooting. The Awards ceremony celebrated all of the favorites of the judges, as follows: Animation, 1st place went to Sebastian’s Voodoo, 2nd place went to Skylight, 3rd place went to Gym Lesson; Documentary, 1st place went to Automorphosis, 2nd place went to Alley Pat: The Music is Recorded, 3rd place went to 45365; Experimental, 1st place went to Even Flowers Wake Up in the Morning, 2nd place went to Horizons, 3rd place went to East Planet, Student, 1st place went to Insha’Allah, 2nd place went to My Homework Ate My Dog, 3rd place went to Non-Love Story; Narrative Short, 1st place went to Small Collection, 2nd place went to Down in Number 5, 3rd place went to Badewanne zum GI; Narrative Feature, 1st place went to Road to Sangam, 2nd place went to Myna is Gone, 3rd place went to Blue Bus; and Best in Show went to Automorphosis. The grand finale of the 2010 Macon Film Festival was a special screening of That Evening Sun starring Macon native Carrie Preston, with Hal Holbrook, Dixie Carter, Mia Wasikowski, and Ray McKinnon. A highly powerful and emotional story, That Evening Sun touches on domestic and animal abuse, ageism, socioeconomic conflict, inner family struggles, mourning dead loved ones, and various legal battles. After the screening, we were treated to a Skype session with Carrie Preston, which was super cool. Carrie’s Mom was there enjoying all of the fans of her daughter asking questions and paying compliments. It was a special end to a special Festival! If you are interested in learning all kinds of valuable information about filmmaking, and viewing a whole spectrum of long and short films, be sure to attend next year’s Sixth Annual 2011 Macon Film Festival! 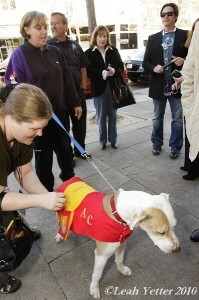 Visit http://www.maconfilmfestival.com/ for more updated information in the beginning of 2011.